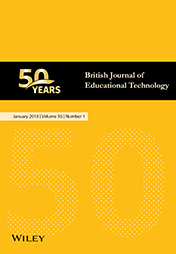 The British Journal of Educational Technology (BJET) is celebrating 50 years of publishing world-class research reports and reviews. BJET has published the first issue of its 50th anniversary volume, and throughout 2019 will continue to celebrating five decades of publishing world-class research reports and reviews. In their editorial, the editors reflect on the journal’s successes both recent and historical, on how it has responded and contributed to new developments in the field, and on their ambitions for the future. They also look ahead to a series of special sections and guest editorials, to be published in subsequent volumes throughout the year, that aim to move our collective understanding forward on pressing issues such as formal and informal learning environments, technology acceptance and adoption, lifelong learning and both personal and professional ecologies. The bumper first issue of the anniversary volume features some special, featured research reviews, including an analysis of BJET content through the decades (Bond, Zawacki‐Richter & Nichols, 2019) that provides a fascinating window onto the dramatic evolution of educational technology as a field between 1970 and today. It reveals the themes that have remained constant over time, including the challenge posed by technological innovation and novelty to conducting longitudinal research that can have an impact on how technology is embedded into educational practice and contexts. Our partners at Wiley have also produced an illustrated 50-year timeline based on this review (see below) which guides readers through the key BJET articles on the hot topics of the day, and the trends in the key terms and issues covered in the journal. the research on emotions in studies on virtual learning (Henritius, Löfström & Hannula, 2019), focussing on the individual rather than group‐level processes. the range of issues that educational researchers need to consider in relation to big data (Daniel, 2019) – particularly big data as a research paradigm. The authors urge potential BJET authors to use these reviews as resources when framing their own studies and articles. This issue also includes papers on the following topics. learners’ participation patterns in forums. Click here for a full list of contents. All content in this issue is free-to-view to non-subscribers for a limited period.